As alone Ji Won we were also worried for Ha won where might she will be. But thankfully Ji Won happen to find Ha won at the cemetery. He feel a bit relaxed seeing Ha won and feel grieved that she was crying in pain all alone. He hugged her and Ji Won make Ha Won feel comfortable being with a friend. He also helped her talking about the situation the pain she was suffering through. Ji Won came home and was feeling a bit sorry for leaving Hye Ji alone on the road. But Hye Ji was full of herself she argued Ji Won that he feels pity for her that's why he helped and become relaxed. Her words were too harsh as she wasn't use to be kind and taking someone's kindness but Ji Won didn't care he clearly mention Hye Ji that he has special feelings for Ha won. 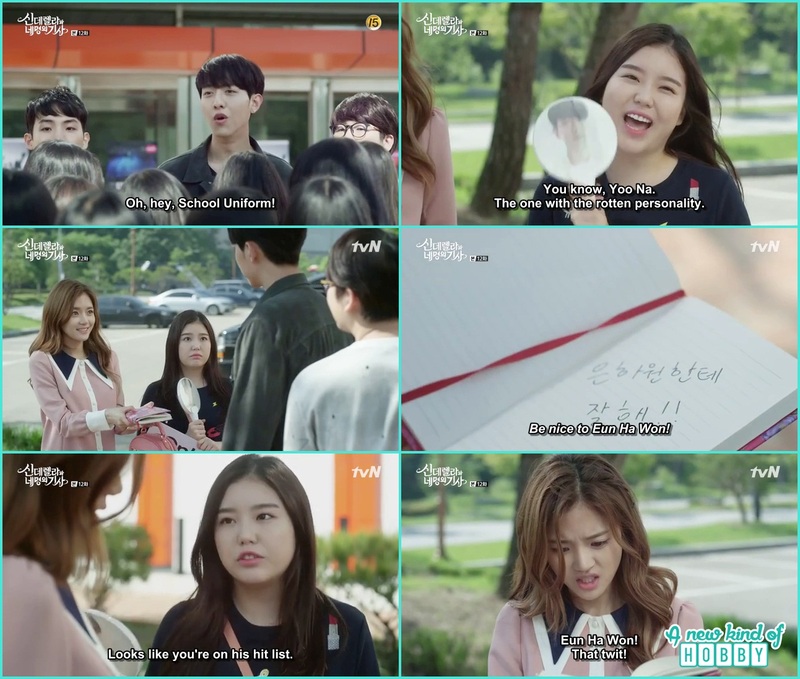 Here we thought Hye Ji might take revenge on Ji Won for rejecting her and will reveal to the chairman that Ha Won and Ji Won are dating. We wish things won't go this way. 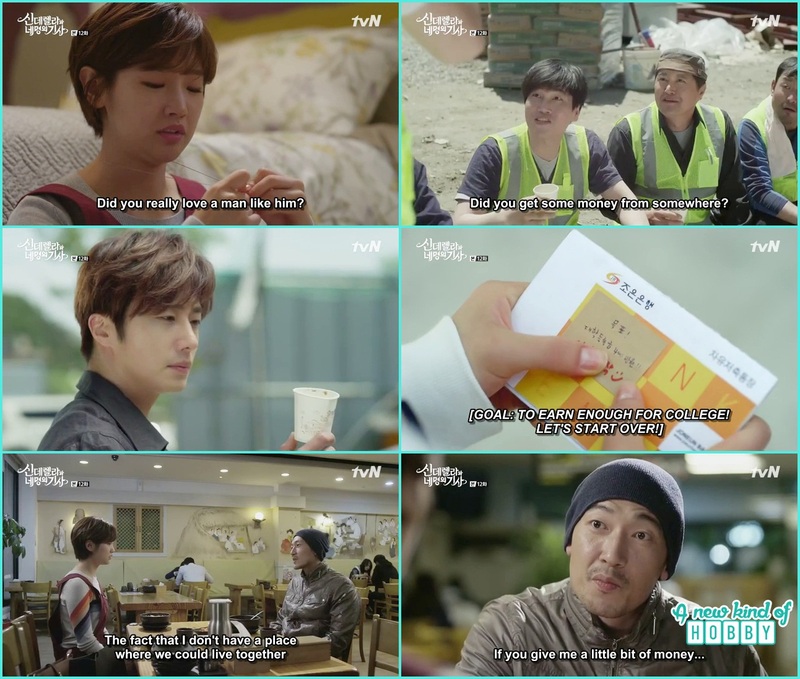 The Ajusshi who came as Ha won father paid a large amount to Ha Won;s mother cemetery and talk to himself that paying this much will be good as the triple of investment would come to me. Ji Won happen to saw the Ajusshi and ask are you Ha Won's father knowing that he is he greets and take him out for coffee. Knowing his financial position Ji won give him a large some of money and also contact number to call if he need any kind of help. Also request the ajusshi to buy Ha Won a meal and few clothes so she will feel happy. We were confused why Ji give a lot of money and also his contact to the ajusshi as we had the feeling that this ajushi might be a fraud or a scam. May be he will become some one who will hurt Ji Won in future. God Knows and the writer also what was the truth. Ha won remember her childhood and also the ajusshi then called him to meet up. During the meeting she ask to leave for 10 minutes as she had to collect things from a friend who works near by. She went out and bought clothes which means she accept him as her father. 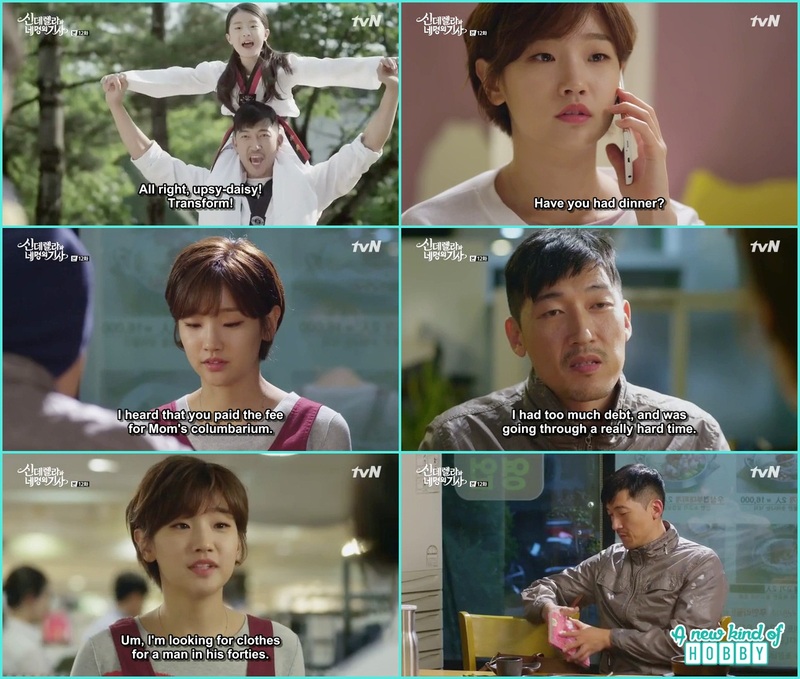 But unfortunately she happen to see the ajusshi was sneaking into her bag and checking her wallet. This breaks Ha Won's heart and trust. Our doubt become more of 100% sure that he isn't the right person to be Ha Won' biological father. Ha Won came back at Sky house and argued with Ji Won that why he gave money she ask him to help. You act put me in more of pathetic and embarrassing position. Ha won being too straight forward make us realize never to keep thing sin your heart that bothers you. As Ha Won left Ji Won, he remember that Ajusshi who called him earlier request for a leased apartment in seoul. That make Ji Won a bit suspicious of him. So he ask him to meet and he will prepare what he needed. The next day Ji Won went to that Ajusshi's work place and saw the other side of him. He was all happy cheering with others and buying them meal as he has won the lottery. there wasn't any regrets pain or suffering on his face. Ji Won pick up his cup, now we come to knew Ji Won did it for the petarnity test. Ha Won was thinking hard how can her mother love a man like this. She also remember when the ajusshi meet all he talk about the money as he was suffering from financial crisis and don't have a place to live and Ha won with. So she went to the bank and take out to the money which she saved for her collage tution. Seo Woo was at the at Fm and the fan girls happen to crowed him. 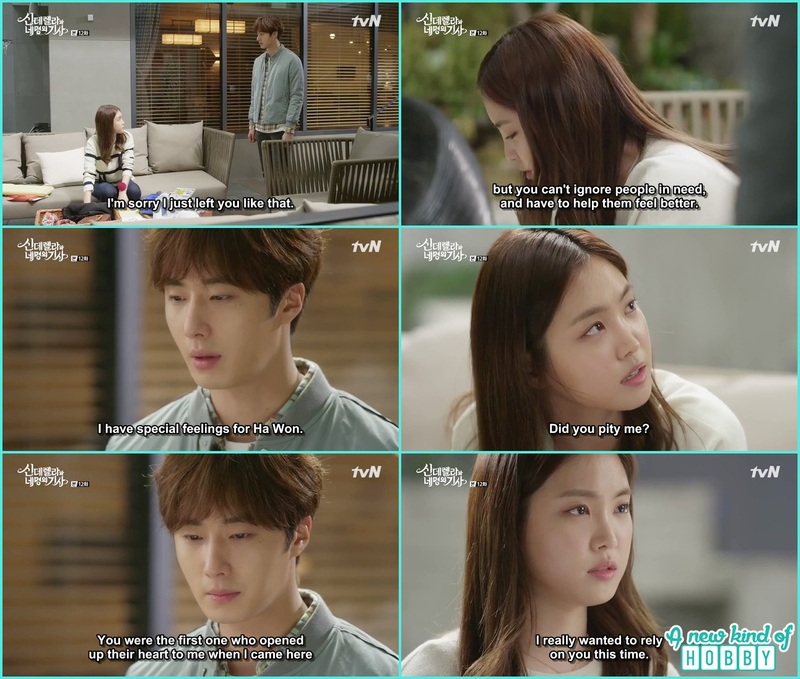 Ha won's step sister Yoo Na also came there, it was all planned to seduce Kang Seo Woo and make him his man. But here also things didn't go as she planned she saw Ja young along with the fans and grinned her teeth why she is here. Ja Young seeing Yoon Na shouted right from there "Honey, You know Yoo Na Ha won's step sister ". Listening to this Seo woo came all along to her she was all happy. He wrote something on the diary and my sister said he is writing something might about Ha Won and yes she was right Kang Seo Woo without signing the autograph just wrote "Be goo to ha Won" and we laughed. Ha Won gathered all her courage and came to meet with the ajusshi. She gave the money to the ajusshi. At first we though she is helping him but she clearly mention there is no need for you to pay my mother cemetery as you are already in financial crisis. At the same moment Ji Won's showed up with the petarnity test result. The plan was ajusshi was all ruined and he was caught within his act by the little Ha Won and Kang Ji Won. Hye Ji after getting dumped and rejecting by Ji Won went out to find another shield for her to survive. We wonder all she worry about to have a man and date but there wasn't a little bit of worry about her father who was in prison after being bank corrupt. This time Hye Ji thew a net on one of Hyun Min friend the news she is seeing him like the electric waves came to Hyun Min. 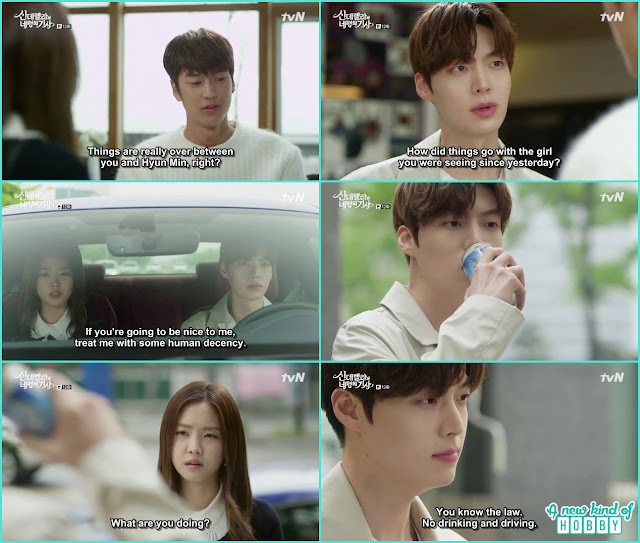 He all worried ran and scold Hye Ji before choosing a man she should think of some standard and humanity to go out with them waaah. Now Hyun Min also showed Hye Ji her place but still he cared for her. On the way back Hye Ji made Hyun Min loose his temper by her nit picking just let me off here why do you care for me. Hyun Min stop th ecar by the convenience store and we though he will also leave Hye ji alone like Ji won did. But he came out drinking and told Hye ji that he is now drunk and can't drive back its out of rules. So she had to drive him back. It was really a hilarious scene, we really enjoyed Hyun Min was as scared as a little kitten lost in the crowd. Hye Ji didn't knew how to drive, it was her first time driving after receiving her driving licence. At last when last Hyun Min patience was about to leave him alone he said continue go on we wish we would able to get there someday since the earth is round ehehehehe. It was the last scene of the episode Ji Won take Ha won along with him telling shall we complete what we couldn't able to do on that day and it was there long drive date. i Won take Ha Won to a very beautiful place we wish we could also have a visit there. He gathered all his courage and gave her the gift he bought on the white day the things messed up and wasn't able to give it. We wonder what gift he would bring and was surprised to see it was an empty gift box. Ha Won was also confused to have an empty gift box. Ji won clear that it was candy he wanted to give her but it melted oh how cute. Instead he expressed his feelings that he likes Ha Won and from now on he will be the one come to Ha Won. He kissed Ha Won for what he was longing for a long time. The episode ends here.